Note: The yellow stripes on the antenna indicate that this antenna operates with a center frequency of 916 MHz. The 14204 is a 0 dBd gain 1/2 wave center-fed dipole antenna with an RPSMA male plug connector. It has an omnidirectional radiation pattern and a center frequency of 916 MHz. The articulating base allows the antenna to tilt 90 degrees and rotate 360 degrees. The antenna’s internal counterpoise eliminates external ground plane dependence. 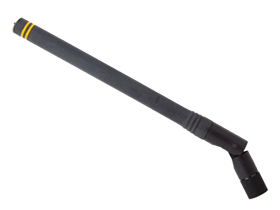 The internal O-ring seal on the connector improves the antenna's ruggedness when used in harsh conditions. -NOTE- Electrical specifications measured with 10.16 cm x 10.16 cm (4 in. x 4 in.) reference ground plane. CR300 Compatible with the -RF407 and -RF412 options. CR310 Compatible with the -RF407 and -RF412 options. CR6 Compatible with the -RF407, -RF412, and -RF451 options. CRVW3 Compatible with the -RF407, -RF412, and -RF451 options. CRVW3-NE Compatible with the -RF407, -RF412, and -RF451 options. The 14204 covers the frequency bands used by some of our spread-spectrum radios operating in the 900 MHz range. Because it has an RPSMA plug connector, the 14204 can only be directly connected to a radio product or cable with an RPSMA jack. Adapters such as pn 28477 and pn 18686 can be used to adapt this antenna to an RF connection other than RPSMA.